A new study by MVI Marketing, “The Luxury Growth Demographic of Opportunity,” surveyed 1,001 female respondents aged 25–40 (millennials) with a household income $75,000 or higher about their brand and buying predilections when it comes to jewelry, shoes, and hotels. Here’s what the study found in the jewelry category. More than 51 percent of respondents said they purchase jewelry for themselves. 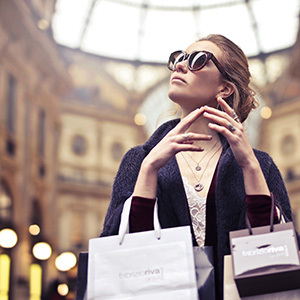 Tiffany, Pandora, Swarovski, Alex and Ani, Gucci, Cartier, Tory Burch, and David Yurman rated as the top brands respondents own or are most likely to purchase (Kendra Scott and John Hardy also ranked, but with fewer than 15 percent of respondents). The study further broke down the type of jewelry respondents are likely to buy this year. Earrings topped that list, with close to 50 percent of respondents saying they are “very likely” to buy a new pair of earrings this year. Necklaces came in second, with 40.5 percent saying they’re very likely to buy one this year. And watches came in last—behind rings and bracelets—with only 23.8 percent of those surveyed saying they would buy a new one this year. In alloys, white gold ranked most popular, with 35.3 percent of women saying it was their preferred jewelry metal. Silver and platinum followed, and only around 10 percent of respondents called rose and yellow gold their favorites, respectively. Diamond jewelry was the highest ranked style of jewelry, followed by jewelry with colored stones, platinum with diamonds, silver with diamonds, and white gold with colored gems or diamonds. The findings are interesting, but certainly are limited—as the pool of respondents (1,001 women) is on the small side. And responses including those that place white metals above rose gold and yellow gold—and ailing Pandora among favorite brands—are a tip-off that perhaps the polling was centered outside of urban areas, many of which (including New York and L.A.) play a major role in setting jewelry trends in the United States.